This stainless steel carpet cleaning wand has a a straight tube, with a bend at the handle for extracting water from carpets while standing. This helps to alleviate back pain and stress as you clean. 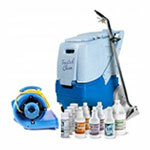 It comes with a single jet for water delivery, and 9" vacuum recovery head. If you are looking for something larger, please take a look at our complete line of carpet extraction wands. 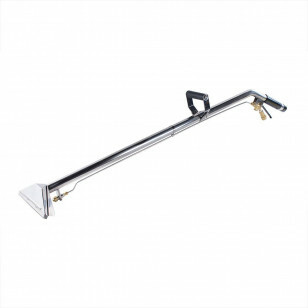 This 1 jet wand can be used with our non-heated and heated carpet cleaning extractors. It is a great multi-purpose wand that can be used to clean underneath furniture, and into corners. The 1 jet delivers plenty of solution for the wand's 9" cleaning path, but you may want to move up to a 2 jet carpet wand, if you are looking for consistent water deliver over a larger area.